The goal is a small parts pack that fits into the stock experience. Set to play nicely with the existing 3.75 m parts in game, the idea of Jool DIRECT is the same as it's Earth counterpart: to use existing technology to create new heavy lifting rockets. Attributions: This mod contains textures created by Benjee10 and are remixed and redistributed under Creative Commons. This mod redistributes Firespitter, created by Snjo and redistributed under permission. Added Altair Lander parts (Rockomax MSDM-16 Fuel Tank and Rockomax MSAM-4 Fuel Tank). Changed decoupler force for DIRECT payload base and payload fairings. Updated Jool III lower stage engine mount for cross-feed disable. Added Jool 120, Jool 246, and Jool III .craft files. Added license to .zip folder. Added 5m Large tank, 3.75m nose cap and tank bottom. 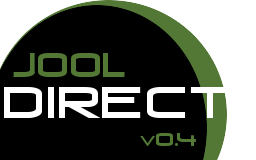 Thanks for downloading Jool DIRECT!